terms to suit at 6 per cent. Fire-brick building 25x50 and lot. Price p. Would accept clear residence or acres cheap land in northwest on plant building, or will sell plant and rest s receipts $3,000 per year Other in ts demand our attention. Best open in Iowa. Will bear invesigation. J. Barry Walker Iowa. CLEAN STOCK OF beries and meats for sale. In small ool town in Iowa, adjoining city of 00, $17,000 business yearly. Fixtures good condition. Stock and fixtures will pice about $2,200 sells with the business $1,500. Selling on account of poor lth. Cash sale. In a holiness com nity. Write BM-207 , care Capital. OD CLEAN HARDWARE AND IM lement store for sale for cash only, in d Iowa town of 700 population; $30,000 siness yearly; fixtures in fine condition; ck and fixtures will invoice about $15 Rich farming community . Buildings 2,000. Reason for selling, want to take trip to Germany after the war. Address M-229 care Capital SNAP IF TAKEN AT ONCE - ON AC count of poor health will sell at large scount my general mdse, business con sting of groceries, dry goods light hard nd s ll s until the loan is repaid. 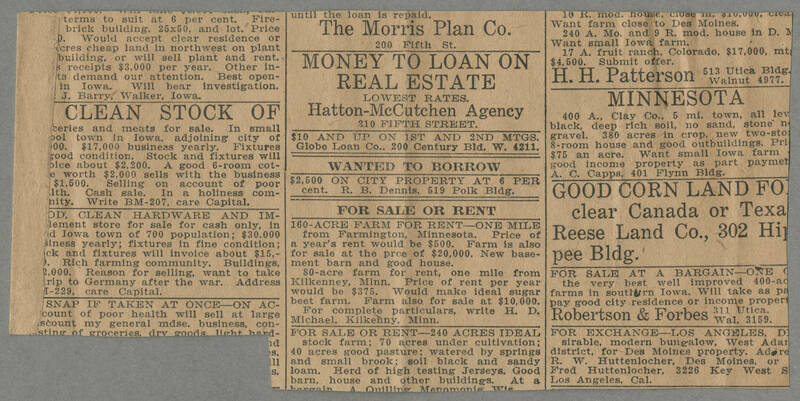 The Morris Plan Co. 200 Fifth St. MONEY TO LOAN ON REAL ESTATE LOWEST RATES Hatton-McCutchen Agency 210 FIFTH STREET $10 AND UP ON 1ST AND 2ND MTGS Globe Loan Co.. 200 Cnetury Bld. W. 4211 WANTED TO BORROW $2,500 ON CITY PROPERTY AT 6 PER cent. R. B. Dennis 519 Polk Bldg. FOR SALE OR RENT 160 ACRE FARM FOR RENT - ONE MILE from Farmington Minnesota. Price of a year's rent would be $500. Farm is also for sale at the price of $20,000. New basement barn and good house. 80 acre farm for rent one mile from Kilkenney Minn. Price of rent per year would be $375. Would make ideal sugar beet farm. Farm also for sale at $10,000. For complete particulars write H.D. Michael,. Kilkenney Minn. FOR SALE OR RENT - 240 ACRES IDEAL stock farm; 70 acres under cultivation; 40 acres good pasture; watered by springs and small brook; soil black and sandy loam. Herd of high testing Jerseys. Good barn, house and other buildings. At a bargain. A Quilling Menomic Wig 10 R mod. house close m $10,000 crea Want farm close to Des Moines. 240 A. Mo and 9 R mod house in D . M Want small Iowa farm 17 A fruit ranch, Colorado $17,000 mtg $4,500. Submit offer H.H. Patterson 513 Utica Bldg Walnut 4277 MINNESOTA 400 A. Clay Co., 5 mi, town. all lev black deep rich soil, no sand, stone gravel. 380 acres in crop, new two sto 8-room house and good outbuildings. Pri $75 an acre. Want small Iowa farm good income property as part payment A.C. Capps,401 Flynn Bldg. GOOD CORN LAND FO clear Canada or Texa Reese Land Co., 302 Hi pee Bldg. FOR SALE AT A BARGAIN - ONE the very best well improved 400-ac farms in southern Iowa. Will take as pa pay good city residence or income propert Robertson & Forbes 311 Utica Wal 3159 FOR EXCHANGE - LOSE ANGELES, D sirable, modern bungalow. West Ada district, for Des Moines property. Addre R.W. Huttenlocher, Des Moines or Fred Huttenlocher, 3226 Key West S Los Angeles Cal.